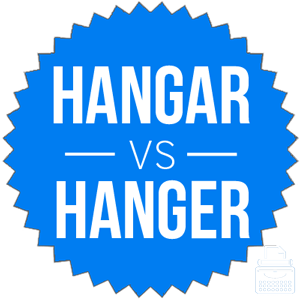 Home » Hangar vs. Hanger – What’s the Difference? Homophones are words that sound alike but are spelled differently and have different meanings. Homophones probably occur in all languages, and English is no exception. Hangar and hanger are two such words. Despite having different meanings and spellings, they are indistinguishable from each other when spoken aloud. Luckily, their meanings are far enough apart that their contexts don’t overlap and cause confusion: a pilot is unlikely to try to land a plane in a closet, for instance, and although a person could conceivably drape clothes over an airplane to dry in the wind, it is not common practice. So what is the difference between hangar and hanger? Continue reading to learn more about these confusing English homophones. In this post, I will compare hangar vs. hanger. I will use each of these words in at least one example sentence, so you can see how they appear in context. Plus, I will show you a mnemonic device that allows you to choose hangar or hanger with extreme accuracy at a moment’s notice. What does hangar mean? Hangar is a noun. A hangar is a place for storing airplanes. Some hangars are large, and can house many planes at once. Others are small, and are designed to shelter only one vessel at a time. Once when I was young, my father took me on a ride in his airplane, while my mother stayed in the hangar because she was afraid to fly. I had intended to defend my country against a German attack from the air, but the attack came by surprise and they bombed my hangar to rubble. Hangar originated in French, but it has been part of English since at least the 1850s. What does hanger mean? Hanger has two primary meanings. It can mean a device for placing clothing on a rack. It can also mean one who hangs things. If you put your shirts on a hanger immediately after removing them from the dryer, they will not be as wrinkly and you may not need to iron them. Hooper is a professional art hanger; he gets paid to hang art in museums. Hanger is much older than hangar, at least as far as English is concerned. It was first used in the 15th century. These two nouns are homophones, but they are used in different contexts. Hangar only has one meaning: a place for airplanes. Luckily, this is not a difficult concept to understand. Hangar has an extra A, which is, coincidentally, the same letter that begins airplane. Thus, airplane and hangar can be inextricably linked in your mind. For an article on aeroplane vs. airplane, see here. Is it hanger or hangar? Hanger and hangar are nouns, and homophones for each other. Hangar is a place for airplanes. A hanger is either someone who hangs things or an object on which clothes can be hung. These words are never interchangeable. 1 What is the Difference Between Hangar and Hanger?